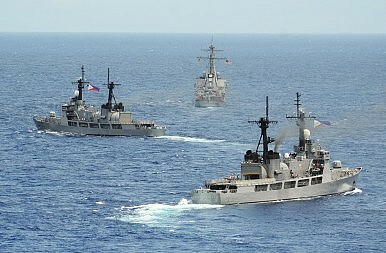 Who’s Got the Biggest Muscles in the South China Sea? The United States and China trade barbs over each other’s muscles. The United States and China have been trading barbs over each other’s ‘strength’ and ‘muscle’ as alarm continues to intensify about Beijing’s massive land reclamation activities in the South China Sea. U.S. President Barack Obama told a town-hall event in Jamaica last Thursday ahead of a Caribbean summit in Panama that Washington was concerned about China’s neglect of international law and norms in favor of a ‘might makes right’ approach. “Where we get concerned with China is where it is not necessarily abiding by international norms and rules and is using its sheer size and muscle to force countries into subordinate positions,” Obama said. “We think this can be solved diplomatically, but just because the Philippines or Vietnam are not as large as China doesn’t mean that they can just be elbowed aside,” he added. Obama’s comments were just the latest in a string of alarming statements by US officials on China’s conduct in the South China Sea over the past few weeks. As The Diplomat reported earlier, on March 31, U.S. Pacific Fleet Commander Admiral Harry Harris Jr. detailed his concerns about China’s creation of a “great wall of sand” in the South China Sea. U.S. Defense Secretary Ash Carter also recently expressed anxieties about the militarization of the South China Sea disputes as he embarked on his first trip to Asia as Pentagon chief. But on Friday, Chinese Foreign Ministry spokesman Hua Chunying attempted to turn the table on Washington by saying at a press briefing that despite Obama referring to China’s size and muscle, “everybody can see who has the biggest size and muscle in the world.” As The Diplomat reported, Beijing also attempted to provide a detailed defense of its extensive land-reclamation activities. “If it is just hard for Uncle Sam to stop bullying others and play a constructive role, it can at least cease acting as the only righteous judge and blaming those who actually fall victim to its daunting “size and muscle,” the editorial added. America’s top Pacific commander takes Beijing to task.